Phantom Stormlights Keep Troops Safe in the Storm. Military vehicles are designed to be covert on the battlefield. Dull paint and infrared lights enhance that requirement on deployment. When those same vehicles are called to duty on the home front, however, that covertness can lead to catastrophe! Unwary civilians can roll right up on those vehicles hidden by foliage, harsh rain or blinding snow-- damaging vehicles and Soldiers alike. When called for a DSCA or MSCA mission, pack a Phantom StormLight™ kit for each vehicle in the convoy! These kits include rapidly deployable lighting systems to make sure that your vehicle can be SEEN! 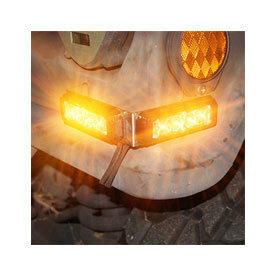 Phantom StormLights™ mount on the windshield (powered by the cigarette lighter/accessory plug, or to the BUSS bar underneath the driver’s seat), and on the rear bumper, powered by the adjacent clearance light. Phantom StormLight™ Kits offer front and rear StormLights™, PLUS optional RED SaberWands™ for traffic control, MightyFlare™ LED road flares (with 3-magnet bases) for marking hazards, and various other accessories. The kits are stored in an orange heavy-duty storage case, a Tactical Tailor™ backpack, or a duffle bag with AA alkaline batteries installed. 1. Mount the lights underneath the reflectors. You can get kits on amber/white for convoy ops or red/blue for LE ops. Our kits can be installed and uninstalled in 15 minutes!